In today’s fast moving world software designers are being asked to automate the decision making processes by putting business rules front and center and not hidden behind layers of software coding. A Decision Table represents multiple related business rules by using conditions, actions and data values in a spreadsheet-style table. The decision table uses columns for the conditions and actions of the rules and rows to represent the associated data values. 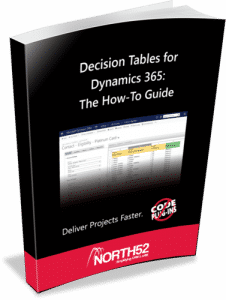 North52’s Decision Tables will turbocharge business rules and processes within your Dynamics 365 system. Quick to read and understand, very little lost in translation. Facilities a common understanding between tester, business analyst, project manager, developer, domain experts, etc. In an Eligibility example for a credit card you will naturally group the rules for Gold Card, Platinum Card, etc. into separate tables. Instead of developers controlling the logic in code domain experts and business analysts can create and edit Decision Tables. Decision Tables allow you to create business rules in an easy to understand format which is different to the traditional IF-Then-Else rule formats. This Decision Table shows how you can represent many business rules in a single spreadsheet table. The sample calculates the insurance premium based on a set of inputs so for example if you had a 5 year old Sedan car and wanted Medical Coverage then the insurance premium would be, 300 + 350 + 700 = 1350. Everything is native to Dynamics 365/CRM. The creation of the Decision Table along with its execution all lives within Dynamics 365/CRM so there are no additional servers or components required. It’s clean, crisp and easy to use for all. North52's mission is to simplify CRM & xRM development on the Microsoft Dynamics Platform.